Ha! Finally getting around to writing up the contemporaneous notes from our birth story â€“ eight months on! Whoâ€™d have thought that the second child would fill every available remaining minute, and turn our lives upside down just as much as the first one?!! Our first birth with our son was a very traumatic experience for us. We had planned a natural birth at home (as the safest option, and that which was most likely to give us the birth we wanted), but in the end, circumstances took us down a very different path: I was diagnosed with pre-eclampsia at 37 weeks, and was hospitalised immediately. I was then in hospital for a week and a half â€“ it sounds like nothing, but felt like a lifetime! We were still hoping for a natural birth, even if it couldnâ€™t be at home, when (very early) labour set in, and the babyâ€™s heart rate was dropping off after contractions. We were advised (well, told actually!) that we should (â€˜would have toâ€™) have a caesarean, for the babyâ€™s sake and for mine. We asked a few questions and quickly, but very reluctantly, agreed that it was for the best. James was born on 4th September 2011, weighing just 4 lb 11oz (due to the pre-eclampsia). He then spent a month on special care before we finally brought him home, feeling relieved but very anxious â€“ we had been told a number of times that we needed to keep his blood sugars up (i.e. feed him effectively), otherwise he might get brain damage. No pressure for a first-time, breastfeeding mother, with a baby who liked to puke a lot then!! Fast forward 2 years, and we were delighted to find we were pregnant with our second child, after a few months of trying. We were determined that this experience would be different. We had thought we had spent about 10 months coming to terms with Jamesâ€™ birth, before feeling like we were able to put it behind us and move on. However, on finding we were pregnant again, many of the emotions we had felt came rushing back. We were also unsure of how the medical establishment would react to us planning a home birth again, and we felt we had to prepare ourselves for a bit of a showdown. We did a massive amount of reading, and had a good understanding of the research, facts and figures to back up our position that home birth was still best for us, in spite of our history. Luckily our NHS midwife was pro-homebirth, and she made sure we ended up with a consultant who was also very pro VBAC, and had no problem with the idea of a home birth. In fact, the only professional who showed any concern was one of the sonographers!! We were also able to meet with the head of midwives at our local hospital, and with her we spent a long time going over Jamesâ€™ birth and how we had felt. We discussed our feelings of powerlessness, of not being listened to, of being rushedâ€¦ The head of midwives reassured us that we should not have been made to feel this way, and she wrote a letter to put in our medical notes to say that if we were admitted again for whatever reason, medical staff were to offer options, justify their suggestions, and communicate with us, rather than telling us what to do. We now realise that we had been holding onto many emotions attached to our first birth, and that it was not until this meeting, over two years later, that we finally did lay it to rest. During our first pregnancy, we had got the support of independent midwives Kate and Angela, as our local NHS service had told us they were unable to guarantee midwives for a home birth (although we later found out that they would have had a legal duty to attend us). Kate and Angela were a huge support, both emotionally and practically, throughout the pregnancy, birth and postnatal period, and we were keen to have them to work with us again. They gave us so much confidence, and of course helped us with our birth plan, and then care of James after he was born. We also did a Hypnobirthing course when we were pregnant with James, and decided to do a refresher for the second birth. We had individual sessions with Claire as it was more convenient than doing a group courseÂ again (no babysitter needed as it took place in our own home!!). We also found that it helped being one-to-one, as Claire was able to tailor the pace and content specifically for us, along with putting up with all our questions, and helping us to work through the issues from our first birthing experience. Physically, I had some personal training sessions for the second birth â€“ the gym is not really my scene, but I was determined to give myself the best chance possible! We also did what we could as regards diet (plenty of protein, and extra supplements) to avoid pre-eclampsia â€“ although there is no real research evidence regarding this, there is plenty of â€˜anecdotalâ€™ evidence which we felt was important enough to pay attention to. The pregnancy itself went very smoothly overall. Lots of the usual niggles, like achy hips, and needing a wee a lot! But generally ok. I had a few migraines at one point which worried me as they can be a sign which might point to pre-eclampsia â€“ luckily that came to nothing. We had a few extra scans because of James having been so small, but then they were worried the baby might be â€˜too bigâ€™!! We felt that the baby would doubtless be the size it ought to be. They also started talking about options for induction when we were just 38 weeks! Then we were very ready: we had acupuncture to try to avoid going â€˜overdueâ€™ â€“ we didnâ€™t want to fight that battle with medical staff if it could be avoided. We felt we had prepared James as well as we could for what was going to be happening, and had sorted out all the equipment etc that we would need. We were also so keen to know how things were going to pan out â€“ after all our preparation! â€“ plus it was hard work being pregnant. And finally we wanted to meet this baby! It wasnâ€™t long before our waiting was over: with a very strange and almighty POP, followed by a gush, my waters broke on Friday 13th May (and no, we donâ€™t believe in that rubbish!) 2011 at about 10pm â€“ we were 39+2 weeks. I had a sudden wave of nervousness wash over me, and found I was shaking â€“ partly because Iâ€™d hoped for my waters to stay intact (in case we didnâ€™t then go into labour spontaneously, but also through most of the birth preferably! ), and partly because I suddenly realised that this was it!! We rang our independent midwives, who advised us to go back to bed to get some sleep if at all possible, and to call whenever we felt we needed them. Well, we did try to sleep! But we hadnâ€™t banked on how much fluid would constantly trickle out (and sometimes gush!) â€“ it was impossible to get comfortable! Then contractions started at about midnight (phew! ), and at about 4am (Saturday now) we rang my Mum (as we needed her to be here when James woke up), and our midwives again for guidance and moral support. We decided to get up, and Stuart started to fill the birthing pool (by hand, with a pan, as we didnâ€™t have a hose!!!). Once Kate and Angela arrived at 5.30am (Saturday), we had a brief and unobtrusive exam (BP etc, babyâ€™s heartrate) and everything was looking good. I got into the pool which was lovely â€“ not least because I didnâ€™t have to worry about my waters trickling everywhere, which was quite annoying! It also really helped me to relax and work with the contractions, which were quite strong by this point. I stayed in a while, and my contractions started to slow. Maybe it was a bit because I wasnâ€™t concentrating on them so much, and/or maybe it was a bit because James got up and wanted to find out what was happening â€“ even though we had explained things to him, of course he needed a little reassurance. I got out of the pool at about 10am (Saturday) to see if that would start things up again, and then once the contractions were re-established, I got back in again (1pm Saturday). Things really seemed to be taking their time â€“ hours were passing, and I was trying to eat a little and sleep a little when I could. We tried going for a walk (2.30pm Saturday) (hard work having to stop every few minutes to hang around Stuartâ€™s neck!! ), and eventually we all agreed that I should have an internal examination to see how things were progressing â€“ this was around 1am on the morning of Sunday 15th. With Jamesâ€™ birth, even though I did have a few early contractions, I was not dilated at all, so I was absolutely delighted to find out thatÂ I was about 4-5cm. At 5am, we decided to have another internal, and we really were very disappointed to find that we were still only about the same, but also that now the cervix was thickening at the front (where of course it should have been thinning). We now had to discuss our options. Things just werenâ€™t moving forward as weâ€™d hoped. We fully trusted Kate and Angela, and knew that there was absolutely no way that they would suggest anything that they didnâ€™t think was really necessary, so we were very open to considering their ideas. We discussed staying at home and seeing how things might go. Our other option was to try going into hospital, to see if we could get things going with a drip. Angela rang to see which consultant was on to see if they would consider this! We also considered the possibility of an epidural to allow me to rest before the final push (so to speak!) â€“ as by this point we had been in labour for 32 hours â€“ and pretty much awake for all this time and more too. Through all this, my and the babyâ€™s vitals were looking good. We decided that hospital was our best option at this point â€“ although we believe strongly in the bodyâ€™s ability to birth, we felt that something must be holding things up. My Mum took James off to stay with her and my Dad (which James loved of course!). Then an ambulance came to get me â€“ it wasnâ€™t an emergency per se, but apparently it was the only way to get to the â€˜top of the listâ€™ at the hospital!! Stuart, Kate and Angela followed in their cars. I had a number of good strong contractions in the ambulance â€“ maybe all the jolting would help things along?!! When we got to the hospital, we felt very empowered. We had made a careful birth plan, including an â€˜if we end up in hospitalâ€™ list, and an â€˜if we end up needing a caesareanâ€™ list, which we were able to give to all the medical staff and discuss with them. Having our trusted midwives with us was also invaluable to our feeling confident with whatever situation might present itself to us. I had another internal â€“ still only 4-5cm aaaggghhh!!! We had a trace taken (of the babyâ€™s heartbeat). There was a little concern that the heartrate was dropping off after the contraction had finished. I queried this conclusion; as far as I could see, the contraction was still going throughout the time that the heartrate dropped off (which is normal). The NHS midwife had a good look at the trace and then agreed that I was right â€“ the reason the confusion had come about, was because (due to the Hypnobirthing principles, and our views on birth I am sure) I was able to talk through the end of the contraction, even though it was apparently a strong one, so they thought it had finished!! The heartrate was fine on the smaller contractions apparently â€“ I didnâ€™t even really notice these ones to be honest, but I didnâ€™t say anything! We discussed our options at length with our attending (NHS) midwife, who was really supportive. We had so many questions to ask, but she dealt with them all brilliantly. My only concern was dealing with the contractions on the drip â€“ I was informed that they wouldnâ€™t be stronger, just that each would come more suddenly (and frequently hopefully!). I was also very concerned about not being able to move about due to the monitor (which would have to be on the whole time whilst I was on the drip), as keeping mobile was really helping me to manage the strength of the contractions. We were offered a scalp clip as an alternative, which we felt was the best option, as it would free me up a little. We were put onto the syntocinon drip. The drug was not yet in my system but immediately the trace showed that the babyâ€™s heartrate was now dipping after the contractions, in spite of them not having changed yet. I immediately made the decision to come off the drip, and go for a section, and Stuart agreed. We had a number of reasons for this, as we had a better understanding this time around about what these drops in heartrate meant. Although not necessarily an issue in itself, I was still so far off the second stage that there was no way it was going to be ok to leave the baby that long before it needed to come out to avoid the risks associated with these drops in the heartrate. Even if the drip could have sped things up, the stronger contractions would have made things even worse for the baby. The registrar and midwives felt that the pattern was showing that potentially the baby was wrapped in the cord. It was all too high risk by this point. We felt we unnecessarily missed a lot at Jamesâ€™ birth, so we spent some time going over our wishes for the caesarean with the registrar. He agreed to all of the points â€“ the only one that wasnâ€™t agreed was to delay the cord clamping (the compromise was that instead he would leave the cord a bit longer when it was cut). In the event, the only thing that wasnâ€™t done, which we didnâ€™t specifically discuss but was on the list, was seeing the cord clamped and cut. But that was a small thing for us. We were prepped for the operation, and were feeling excited, and nervous too â€“ mainly of having the spinal anaesthetic (the thought of a needle in the spine is not top of my list of desirable experiences!). Our focus now was on meeting our baby â€“ and finding out if it was a boy or a girl too of course! I experienced lots of strange sensations â€“ cold (where they spray you with very cold liquid to test what youâ€™re feeling), numbness, and a lot of uncontrollable shaking due to the anaesthetic (I had to ask for something to hold to stop it â€“ so they found me a roll of sellotape!!). They brought the beautiful baby out (all I felt was a tugging sensation) at 4.34pm (we had been in labour for around 40 hours), and it was fantastic that it was me who said â€œItâ€™s a girl! !â€ I was very surprised, as I had really thought it was going to be another amazing boy! As I was lying pretty flat, it was Stuart who saw first that she was a girl, but I loved that I was the one who announced it :). And I saw my beautiful baby being born this time: no matter that it wasnâ€™t the way weâ€™d hoped, I still felt completely involved and in control. She was very pink, and cried a bit. They take the baby to dry it briefly as itâ€™s so cold in the operating room, which of course is not ideal, but then she came straight to me. I had asked for the gown to be just laid on me, so that it could be moved for the baby to lie on me skin to skin â€“ and so we had our first cuddle. Fairly quickly I noted that â€œSheâ€™s quite blueâ€¦?â€ â€“ I wasnâ€™t worried (after all, sheâ€™d had her placental oxygen supply whipped away from her! ), but she was looking like she needed a little help. There was no panic, just a sort of â€œOh yes, sorry, may I just take her from you?â€ sort of response, and she was given some oxygen to get her going a bit. We felt so much more involved with everything this time â€“ I even asked, and was able to see, her first poo on the towel theyâ€™d wrapped her in! I was stitched up whilst all this was going on, and then it was off to recovery with our new baby in my arms. She breastfed straightaway with me lying down. We were shown the placenta (another thing we missed the first time). She was weighed â€“ a good 8 lb 1 oz, which was wonderful after James having been so small. Then it was time for some tea and toast â€“ unfortunately I then started vomiting which lasted for a few hours on and off, so in the end I agreed to an anti-nausea injection, which really helped. The next day I was eating, and up out of bed (I wasnâ€™t able to get up for two days with James, as I wasnâ€™t well with the pre-eclampsia, so this was a vast improvement!). The days and weeks after I was nervous when the catheter was removed â€“ I wanted to be up for when James came to visit, but I knew I needed to wee a certain amount within a certain time, no pressure there then!! But it was all fine â€“ and I was able to give my boy a cuddle once heâ€™d got past being a bit overwhelmed by it all! The dressing was taken off the scar after 5 days, and there were no stitches to take out. It was sore but not at all unbearable. It was difficult not being able to have the usual big cuddles with my boy though! 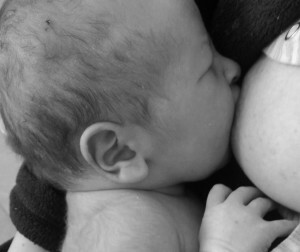 And it could be hard to get comfortable breastfeeding, but it really wasnâ€™t too bad. At 3 weeks post-op there was the usual lochia (bleeding) still, but it was easing, and pretty much gone by six weeks. The scar was tender but ok at 3 weeks. I took a few weeks to stop the painkillers but didnâ€™t really notice the difference when I came off them, so I think it must have been the right time! My stomach itself was sore, tender and bruised â€“ the hole they yank the baby out of (and they really do have to tug at it!) is quite small, and she wasnâ€™t exactly tiny herself, so everything got rather stretched. We had decided before this birth, that no matter what happened, we would separate the birth from the baby, so that we could celebrate the latter even if the former didnâ€™t quite go to plan (although we were confident it would!). This made all the difference for us â€“ there was no sense of loss or grieving immediately after the birth like we had first time around, which meant we could spend our time enjoying our new baby, and focusing on introducing her to her big brother. The Hypnobirthing principles helped us so much as well. One of the affirmations we used was â€œI am prepared to meet whatever turns my birthing takesâ€ â€“ at first I really struggled with this, as I was really really not prepared not to have the birth I wanted! But that is the purpose of the affirmations after all, so I repeated it to myself anyway, and you know what? I was prepared! It helped massively with the decision-making â€“ I knew what I needed to do, and didnâ€™t need to question how I would feel afterwards. It was wonderful, and we are so glad we did the course for a second time â€“ especially as we had taken our time to find the practitioner who was right for us: Claire was a massive support to us all the way through the pregnancy and beyond. We were also very glad to have had our independent midwives, Kate and Angela, to support us again. Even though they werenâ€™t able to actually â€˜deliverâ€™ the baby themselves, they were a completely invaluable support to us, and we know we wouldnâ€™t feel so positive about the birth if we hadnâ€™t had them with us all the way. And we did manage to wangle one of them coming into theatre with us, so they were still very much involved, and of course they did all of our aftercare. It was fantastic to have people we completely trusted to support us, and with whom we had built up such a strong and positive relationship. We did of course have some queries about why we had ended up reaching the point we did â€“ why had things taken so long, and not progressed further, after such a promising start with strong and regular contractions? But there was no question in our minds that having reached the point we did, we made the right decision. We strongly feel that my body/baby knew what needed to happen, which was that it was too risky for the baby to come out the usual way. As it turned out, in spite of being beautifully head down for most of the months before the birth, she actually had her head tilted back, a hand above her head, and the cord wrapped around her. We wondered if we should have perhaps not had James around, as maybe concentrating on him slowed my labour?? But many people have successful births with other children present, so we donâ€™t really think that was it. I guess we will always feel sad for what we have missed, and will always wonder â€˜What ifâ€¦â€™ a little. That said, second time around we had a really wonderful birth experience, and actually wouldnâ€™t change either of our experiences when it comes down to it, as they are so much part of who we all are as a family. Despite our second birth being so similar to the first in some ways (i.e. emergency c-section rather than our hoped-for home birth), it was actually rather cathartic, and helped us work through some residual feelings from the first birth, so in that sense it felt like a good thing. And we were so pleased to have experienced labour this time â€“ we wouldnâ€™t have missed it for the world! We feel we did the very best we could in the circumstances for both of our births. We had done our homework, and although of course there was a chance in both cases that we could have continued with a vaginal birth, the risks were too great. It is difficult to feel so strongly that vaginal birth is the right option nearly all the time, yet not to have been able to achieve that ourselves. But ultimately c-sections are lifesaving operations and essential in some situations, and we feel that we did everything we possibly could to give ourselves the best chance of vaginal birth â€“ it just wasnâ€™t to be. We had such varied feelings with the birth that itâ€™s hard to put it into words! Firstly, excitement and delight of course, as we were absolutely ecstatic about our wonderful new baby. Secondly, we were happy with the positive experience of the birth which we had this time around, and actually enjoyed the experience. And finally, we did of course feel some sense of disappointment with our lack of vaginal/home/waterbirth. But definitely the feelings were in that order! And we only really considered the disappointment after a couple of weeks, which gave us plenty of time to celebrate our baby, before grieving about what we had lost, and then swiftly moving on. Maybe we would have another child, maybe we wouldnâ€™t. But if we did make the choice to do that, I am sure we would have far less worry throughout the pregnancy (about mode of birth and about pre-eclampsia). And although of course a vaginal birth would always be our first choice, I know we would focus less on the type of birth, as we can now see that although not an ideal start, a c-section can still be a positive experience. With no other complications, we would of course like a home, vaginal, waterbirth!